The Octagon has finally made its way to Russia. 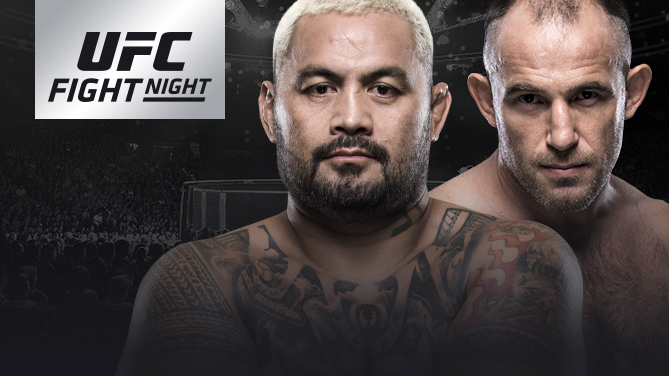 On Saturday the UFC will host its first ever event in the city of Moscow when heavyweight legend Mark Hunt goes to battle with submission artist Aleskei Oleinik. The event will be broadcast exclusively over UFC Fight Pass, starting at 10:30 am EST. These are your reasons to watch UFC Fight Night: Hunt vs. Oleinik. Combat sports have always been popular in Russia but with the UFC finally making its maiden voyage into the country, there is an opportunity for that popularity to grow tenfold. At last night’s open workout it was evident that this event is something that fans have been clamoring for, as they packed the Cition Arena to the brim. This event is the first opportunity, not only for fans to watch their local favorites fight, but for many of the fighters to put on a show for their friends and family in Russia. Expanding to such a talent rich market, such as Russia, also opens the door to discovering more athletes and bringing the production to an incredible important part of the MMA world. A fight between Mark Hunt and Aleskei Oleinik is one of those fights that feels like it should have been booked for UFC 1. Hunt is a legendary brawler who puts his incredible fighting spirit and power on the line every second in the Octagon. On the other side is Oleinik, who is famous for his breath taking (literally) submissions that leave opponents wondering where they went wrong. Both heavyweights are veterans who are looking to add exclamations to their legacies, with Oleinik hoping to secure a victory in the first UFC main event in his home country and Hunt trying to show the people of Russia why the Super Samoan is one of the most exciting fighters of all time. The best part about this fight, might be that the clashing styles of these fighters creates so much uncertainty. Will Oleinik be able to get Hunt to the ground and catch him with an amazing submission? Will Hunt keep Oleinik on his feet and land a powerful strike that sends him crashing to the canvas? From top to bottom you might not recognize many of the names on this card. But if you take a look at the records and the win streaks boasted by some of these fighters, it might grab your attention. For starters, Nikita Krylov, is making his return to the UFC after putting together a four fight win streak on the international fight scene. He will be taking on No. 4 ranked light heavyweight Jan Blachowicz. And then there is Alexey Kunchenko, the undefeated fighter making his UFC debut at a stunning 18-0. Kunchenko, 34, brings his 14 finishes to the Octagon against veteran Thiago Alves. The electric Petr Yan is also making his second UFC appearance against Jin Soon Son. His first fight ended with a KO in the first round and he has plans to ruin the UFC debut of the 9-2 Soon Son. The card also features Rustam Khabilov, who is on a five fight UFC win streak. He is taking on Kajan Johnson who is coming off a loss at UFC Calgary. These are just a few of the many fighters with very impressive records and tons of talent. You’re definitely going to want to tune into UFC Fight Pass, Saturday morning at 10:30 am EST to watch these guys put on a show.